I attended the Star of Texas Tattoo Convention and took a whole bunch of photos of knuckle tattoos! Various knuckle tattoos from this past week. Two weeks ago the KnuckleTattoos.com crew headed down to San Antonio for the Alamo City Tattoo Expo. 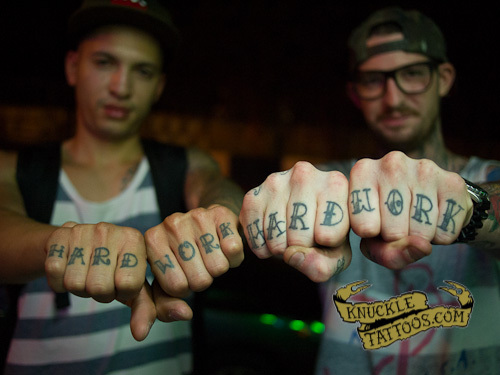 We met a ton of great people talked to them about their knuckle tattoos. I got some great pictures and we heard some great stories. My pal Kai from Mad Pengin came along for the romp and caught a bunch of interviews on video. We will be posting the videos as we have time to edit them all together. In the mean time, here are the photos I took. As always, if these are your knuckles or the knuckles of someone you know and you want to add the story, just email me at nathan[at]knuckletattoos[dot]com and I will feature the story in a separate post. Last week was the South by Southwest music festival in Austin, Texas. I spend most of the week at Beerland working the door and taking photos of knuckle tattoos. I didn’t get the details on most of them since I was kind of busy. Hopefully some of them will contact me and I’ll be able to update with their stories. See the whole set after the jump.